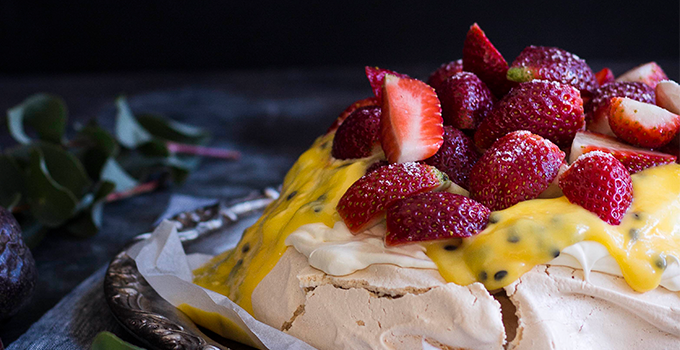 Regardless of its origins, pavlova will always be strayan’ (ask an Aussie and we’ll tell you). Adding a new, delicious spin to the mighty pav is this one topped with passionfruit curd. Right out of Helen Tzouganatos’s new gluten-free baking book Hungry & Fussy – we’re shown how to step by step make a tropical pavlova that will win any dessert throwdown. Tis the season after all. Pavlova with Passionfruit Curd Serves: 10 Prep Time: 10 minutes Cook Time: 1 Hour INGREDIENTS Pavlova 6 egg whites 1 ½ cups or 310g caster sugar 1 ½ tsp white vinegar 1 tsp gluten-free cornflower, sifted Passionfruit Curd 2 eggs, lightly whisked 40g fresh passionfruit pulp 1 ½ tbsp. lemon juice ½ cup or 11g caster sugar 80g unsalted butter To Serve 2 cups thickened cream, whipped 500g strawberries halved Method 1 Preheat oven to 150c 2 Beat eggs whites in a bowl until soft peaks form. Slowly add sugar, beating well between each addition until glossy 3 Add vinegar and sifted cornflour and beat to combine. 4 Spoon the mixture onto a lined baking tray and form a dome shape with your spatula. Reduce the oven to 120c and cook for 1 hour. Turn off oven and leave to cool completely. 5 Whilst waiting for the pav to cool down make the passionfruit curd. Lightly, whisk eggs in a bowl. Add passionfruit pulp, lemon juice, sugar and whisk together. Melt the butter in a saucepan over low heat and then slowly whisk through the passionfruit mixture. Stir over low heat for about 10 minutes or until mixture thickens. 6 To serve dollop whipped cream on pavlova followed by cooled passionfruit curd and garnish with strawberry halves. 7 Devour completely Tips Room temperature eggs whip better than cold eggs. When adding sugar to the meringue, ensure the egg white have formed peaks first because sugar can reduce the volume of the meringue if added too early. Let the Pavlova cool in the oven overnight. The longer drying time creates a super crispy, chewy shell – a must for any great Pav.